Osama bin Laden once crowed to an interviewer, "Believe me, when your children and your wife become part of your struggle, life becomes very enjoyable." The late al-Qaeda chief uttered those words before 9/11, when he was able to keep his four wives and many children living comfortably in separate houses across Afghanistan. Every few weeks or so, bin Laden would drop in on a wife to fulfill his husbandly duties. But at the end, his rosy portrayal of being married to jihad was sorely tested. His family must have driven him nuts. During his last days in Abbottabad, Pakistan, bin Laden had to contend with three wives and 17 noisy children under one roof. He had no escape from the din, save for furtive pacing around the garden late at night or vanishing into his so-called Command and Control Center, a dank, windowless room. Swathed against the Himalayan chill in a woolen shawl, he recorded rants that displayed an ever widening disconnect with the daily grind of terrorism: his last oddball offerings were on climate change and capitalism. Bin Laden, the world's most wanted terrorist, was also a family man. An Arab woman married to an al-Qaeda fighter told TIME that after 9/11, bin Laden and his lieutenants made provisions for their families to flee the impending NATO invasion of Afghanistan. His youngest wife, Amal Ahmed al-Sadah, may have escaped to Yemen via Pakistan, while bin Laden's other wives are thought to have fled through Iran. But the terrorist got lonely. After setting up camp in Pakistan and breaking his own orders, he summoned back three wives: the most recent addition, al-Sadah, plus two Saudi women he'd wed in the 1980s. The Saudis were mature, educated women  Khairiah Sabar was a child psychologist and Siham Sabar a teacher of Arabic grammar. (They converted a room in the Abbottabad compound into a classroom.) Bin Laden had been their husband for 25 and 27 years, respectively. U.S. counterterrorism experts, who are eager to interrogate the wives, now in Pakistani custody, will surely want to know how al-Qaeda smuggled the boss's wives and their kids to Abbottabad to ease his solitude. Under Islam, polygamy is allowed but only if the husband is able to treat all his wives equally. Muslim law also states that a man may have only four wives at a time. Bid Laden married six times, but one marriage ended in divorce and the other was annulled. While in Afghanistan, the wives were able to steer clear of one another. According to a 2002 interview that "AS," presumed to be al-Sadah, gave to the magazine Al Majalla, the women "did not live in one house. Each wife lived in her own house. There were two wives in Kandahar, each with her own house. The third wife had a house in Kabul, and the fourth in the Tora Bora mountains." Even then, a polygamous family is not without its frictions. When al-Sadah joined the growing clan in 2000, "bin Laden's other wives were upset, and even his mother chastised him," according to Lawrence Wright, journalist and author of The Looming Tower: Al-Qaeda and the Road to 9/11. Judging by the blueprints of the Abbottabad compound, bin Laden tried to keep his three families separate but equal. Each wife and her children were allotted their own floor, and bin Laden would spend time with each group. When U.S. Navy SEALs raided the compound, they found bin Laden on the third floor with al-Sadah. Initial White House accounts say she was shot in the leg while trying to shield her husband. In all, bin Laden had six wives. Wife No. 1: Najwa Ghanem, a Syrian and a first cousin, was 15 when she married bin Laden, scarcely two years her elder. Back then, bin Laden was a rich and well-connected Saudi youth, and Ghanem had every reason to believe she was destined for a cushy life of luxury. Instead, she ended up raising 11 children on the run, struggling to keep her good looks in the scorching deserts of Afghanistan. (Bin Laden didn't believe in air conditioning or iced drinks, say his former comrades.) After 9/11, she fled Afghanistan with a mentally disabled son and is thought to have returned to her native Syria. Still married at the time of bin Laden's death, she is technically his fourth widow, although she is not in custody. Wife No. 2: Khadijah Sharif was a teacher and nine years older than bin Laden when they were wed in 1983. She reportedly bore him three children before they were divorced sometime between 1993 and 1996, when they were living in Sudan and bin Laden fell afoul of the Saudi regime. Wife No. 3: Khairiah Sabar, whom bin Laden wed in 1985, was the "spiritual mother" of the sprawling family, according to a woman who knew the bin Ladens in Afghanistan. "She was very openhearted. Everybody went to her for advice," she says. This source claims that after 9/11, Sabar fled through Iran, where she was detained under house arrest before the Iranians allowed her to return to Saudi Arabia. 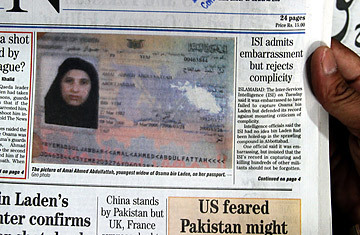 From there, she slipped back into Pakistan to rejoin the al-Qaeda chief in Abbottabad. Wife No. 4: Siham Sabar, who was also captured in the Abbottabad house, wed bin Laden in 1987. Militant sources say that after 9/11, she may have slipped into Pakistan, remaining there in hiding until it was safe for her to answer her husband's summons. Wife No. 5: Bin Laden's fifth marriage is a mystery. He rashly wed a woman of unknown nationality in Khartoum in 1994, but the marriage was annulled before it was consummated within 48 hours. Wife No. 6: Amal Ahmed al-Sadah may have been as young as 15 when a $5,000 price was paid to her Yemeni family before she was shipped off to marry bin Laden, nearly 30 years her elder, in Kandahar. Wed in 2000, they had one daughter, Safiyah, who was allegedly in the bedroom with her father and mother when the Navy SEALs shot him dead. So far, Pakistan has not charged bin Laden's three widows of any crime. Pakistan has said it will eventually expel the three to Yemen and Saudi Arabia, and will grant direct access to U.S. interrogators when the trio "is ready." As for useful intelligence information, an Arab woman with ties to al-Qaeda tells TIME that al-Qaeda militants aren't big on pillow talk. "They tend not to tell their wives anything about their operations," she says. Pakistani journalist Hamid Mir, who interviewed bin Laden in 1997, recalls, "Osama once told me men should never share their secrets with women." Nevertheless, these three women all have vital stories to tell of how al-Qaeda's network in Pakistan managed to smuggle them back to their forlorn terrorist husband and keep them hidden for so long. As widows, under Islam, they are free to marry again, if they wish. But few suitors are likely to step forward. Marrying the widow of the world's most wanted man has its own complications. Tim McGirk, a former TIME bureau chief, is a fellow at the University of California at Berkeley's investigative reporting program. Watch TIME's video "After bin Laden: Where Do We Go from Here?"